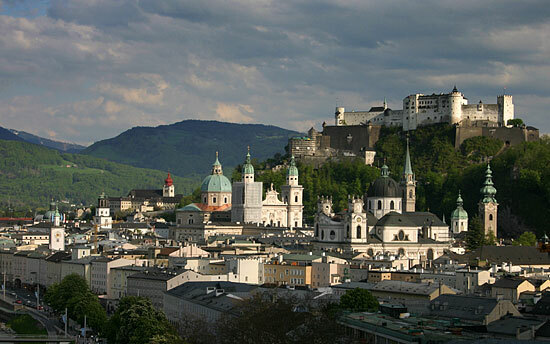 return to "summer photos 2"
Fed up with views on the skyline of the Old Town of Salzburg? Only a few more to go... This one was taken in early summer and would be almost perfect if it wasn't for the bloody scaffolding on the Salzburger Dom Cathedral. Note that essentially all other spires of the city centre are lit nicely in the afternoon sun. From left to right you can see the Kajetanerkirche (Cajetan Church), the tower of the Altes Rathaus, the Glockenspiel (Carillion) of the Neue Residenz, the church of Stift Nonnberg nunnery, the Salzburger Dom, the Kollegienkirche (Collegiate Church), the pointy, Gothic tower of the Franziskanerkirche, and finally cupola and tower of the church of Stift St. Peter.